Seung-Tae Choi doesn’t look the part of a traditional athlete, not with his shaggy hair, smallish build and an expression that says ready to nap rather than game on. During all the hours he spends playing video games, though, the 21-year-old from South Korea certainly acts it. “We’re not here to have fun,” he said through a translator. Choi — better known to his fans as Bdosin — and his teammates with the London Spitfire like to think they’re making a statement on a major stage this weekend: esports might not be the same as football or basketball, but the competition is as real and the lifestyle as intense as it is for any traditional sports star. The Spitfire won the Overwatch League’s inaugural championship Saturday at Barclays Center in Brooklyn. Choi had spent years chasing a career in the 6-on-6, first-person shooter, and now he’s splitting a $1 million top prize with his Korean teammates. London swept the Philadelphia Fusion, a club featuring players from nine countries, in two matches at the end of a seventh-month season. The twelve-team league has many traditional sports markers: regional divisions, a preseason and postseason, and even broadcast rights deals with Twitch and ESPN. Blizzard Entertainment, the creator of Overwatch, structured the league on traditional sports, even bringing in NFL team owners Robert Kraft (Patriots) and Stan Kroenke (Rams) as franchise owners. And the players’ lifestyles don’t appear to be much different from more recognizable stars. For most in the league, the day starts after a good night’s sleep. 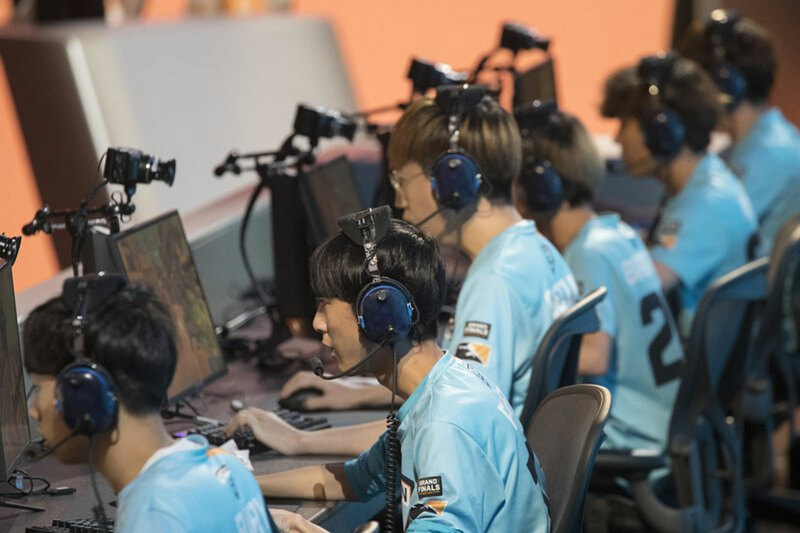 Overwatch coaches and managers have strongly encouraged a full eight hours — the Spitfire turn off wifi in team housing at 3 a.m. to cut down on distractions — and even employed physical trainers to further promote a healthy lifestyle. After a breakfast cooked by a team chef, they go to work. It starts with warmups — normally some individual screen time. Then comes in-game practice, usually scrimmaging for six-plus hours. At that point, many teams encourage players to step back from the PC to talk strategy. Then there’s solo time for sharpening skills. When the esports-as-sports debate really matters is off the field. As in, who will partner with the industry? ESPN has a two-year deal to broadcast Overwatch matches, and gaming could even one day find itself in the Olympics — Overwatch League Commissioner Nate Nanzer was just in Switzerland with Blizzard Entertainment to meet with the International Olympic Committee. Gaming doesn’t look like a traditional sport, but when the players talk, it sure sounds like one. The buzzwords and phrases have a familiar feel — players talk about execution, focus, team chemistry and determination. “Winning the final,” Gouzerch said. People around esports liken their games to darts, bowling or pool. No 40-yard dash times, bench presses or vertical jumps needed. But some players are more physically gifted than others. Nanzer pointed to New York Excelsior sniping specialist Do-Hyeon “Pine” Kim as an example earlier this season. “I promise you, you physically cannot do what he does,” Nanzer said. “There’s actually a physical component of moving that cursor across the screen in a split-second and putting it on a pixel. That’s a physical move. And you can practice a lot, and you can get better at it, but you couldn’t get to his level at it. Talent separates amateurs from professionals. In the Overwatch League, the pros get a minimum base salary of $50,000 with healthcare and a retirement savings plans. With stakes like the $1 million grand prize, there’s another traditional sports hallmark apparent: the sting of defeat. The Fusion lost the first match to the Spitfire on Friday night and then again on Saturday afternoon. Tension and disappointment was apparent in each of their post-match press conferences. Then there was the Spitfire, riding high and relaxed after beating Philadelphia on both days of competition. The finals could have stretched into three matches, but London ended it in two and became the first club to hoist the Overwatch League trophy. The London Spitfire won the first Overwatch League Grand Finals, with Profit taking home the MVP. Watch esports analysts Treavor Scales, Emily Rand and Tyler Erzberger break it down live from the Barclays Center in Brooklyn.